Freire, K. M. F. & Carvalho Filho, A. Richness of common names of Brazilian reef fishes. Pan-American Journal of Aquatic Sciences, 4(2): 96-145. Download PDF file (367 Kb). Aranda, M. Evolution and state of the art of fishing capacity management in Peru: The case of the anchoveta fishery. Pan-American Journal of Aquatic Sciences, 4(2): 146-153. Download PDF file (71 Kb). Mai, A. C. G. & Loebmann, D. Size and number of newborn juveniles in wild Hippocampus reidi broods. Pan-American Journal of Aquatic Sciences, 4(2): 154-157. Download PDF file (80 Kb). Martin�z-Porchas, M., Mart�nez-C�rdova, L. R. & Ramos-Enriquez, R. Cortisol and Glucose: Reliable indicators of fish stress?. Pan-American Journal of Aquatic Sciences, 4(2): 158-178. Download PDF file (294 Kb). Vaske J�nior, T., Teixeira, A. F. & Gadig, O. 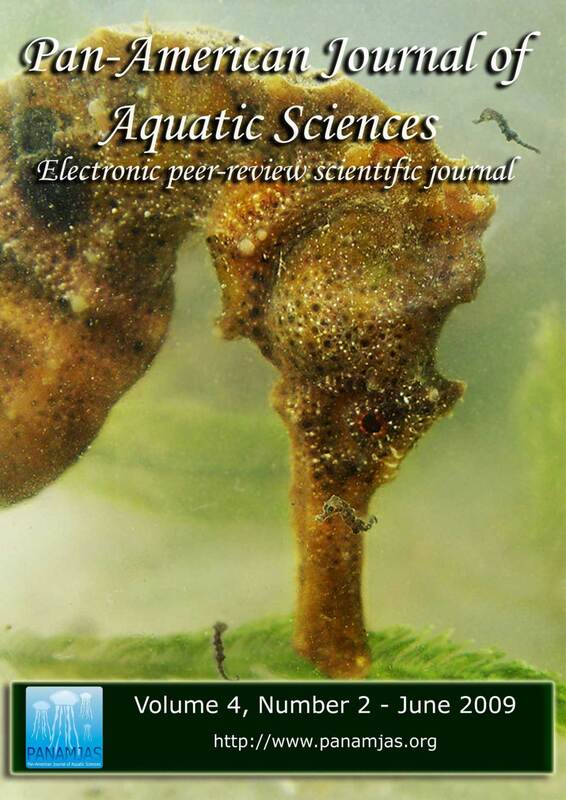 B. F. Aspectos biol�gicos do peixe-olhudo-dentinho, Synagrops bellus (Actinopterygii: Acropomatidae), da plataforma externa e talude superior do estado de S�o Paulo, Brasil.. Pan-American Journal of Aquatic Sciences, 4(2): 179-187. Download PDF file (208 Kb). Hemida, F., Ben Amor, M. M. & Capap�, C. First confirmed record of the blunthead puffer, Sphoeroides pachygaster (Osteichthyes: Tetraodontidae) off the Algerian coast (south-western Mediterranean). Pan-American Journal of Aquatic Sciences, 4(2): 188-192. Download PDF file (389 Kb). Sarmento-Soares, L.M., Mazzoni, R. & Martins-Pinheiro, R.F. A fauna de peixes na bacia do Rio Jucuru�u, leste de Minas Gerais e extremo Sul da Bahia. Pan-American Journal of Aquatic Sciences, 4(2): 193-207. Download PDF file (777 Kb). Rotundo, M. M. & Vaske J�nior, T. Occurrence of the white anglerfish, Lophiodes beroe Caruso, 1981 (Lophiiformes: Lophiidae), in Brazilian waters. Pan-American Journal of Aquatic Sciences, 4(2): 208-211. Download PDF file (220 Kb). Medeiros, D. V., Nunes, J. A. C. C. & Sampaio, C. L. S. A mutton hamlet Alphestes afer (Bloch, 1793) reproductive event in northeast Brazil. Pan-American Journal of Aquatic Sciences, 4(2): 212-215. Download PDF file (164 Kb). Lanfranconi, A., Hutton, M., Brugnoli, E. & Muniz, P. New record of the alien mollusc Rapana venosa (Valenciennes 1846) in the Uruguayan coastal zone of R�o de la Plata. Pan-American Journal of Aquatic Sciences, 4(2): 216-221. Download PDF file (314 Kb). Lopes, M. N., Vieira, J. P. & Burns, M. D. M. Biofouling of the golden mussel Limnoperna fortunei (Dunker, 1857) over the Anomura crab Aegla platensis Schmitt, 1942. Pan-American Journal of Aquatic Sciences, 4(2): 222-225. Download PDF file (248 Kb). Silva, A. M. A., Barbosa, J. E. L., Medeiros, P. R., Rocha, R. M., Lucena-Filho, M. A. & Silva, D. F. Zooplankton (Cladocera and Rotifera) variations along a horizontal salinity gradient and during two seasons (dry and rainy) in a tropical inverse estuary (Northeast Brazil). Pan-American Journal of Aquatic Sciences, 4(2): 226-238. Download PDF file (402 Kb). Bonecker, F. T., Castro, M. S. & Bonecker, A. C. T. Larval fish assemblage in a tropical estuary in relation to tidal cycles, day/night and seasonal variations. Pan-American Journal of Aquatic Sciences, 4(2): 239-246. Download PDF file (290 Kb). Gomes, C. P., Beasley, C. R., Perote, S. M. O., Favacho, A. S., Tagliaro, C. H., Ferreira, M. A. P. & Rocha, R. M. Gametogenesis in the mangrove mussel Mytella guyanensis from northern Brazil. Pan-American Journal of Aquatic Sciences, 4(2): 247-250. Download PDF file (555 Kb). Pandya, P. J. & Vachhrajani, K. D. . Pan-American Journal of Aquatic Sciences, 4(2): I. Download PDF file (306 Kb). Lira, S. M. A., Amaral, F. M. D. & Farrapeira, C. M. R. . Pan-American Journal of Aquatic Sciences, 4(2): II. Download PDF file (207 Kb).